A natural setting so splendid to bring French impressionist painter Claude Monet among my favorites, to immortalize it in his paintings. 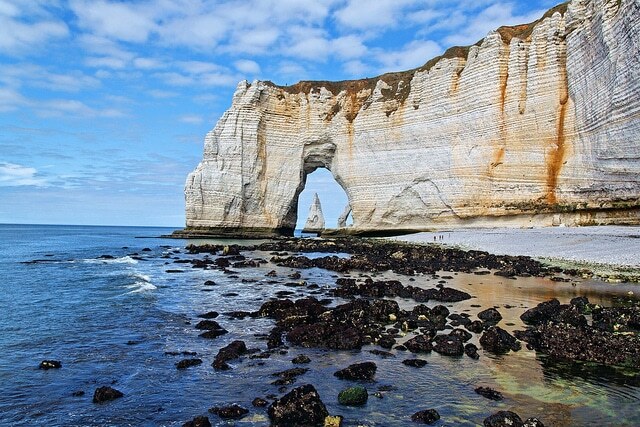 It was precisely his paintings of Etretat in Normandy, introduced me to this wonderful area. 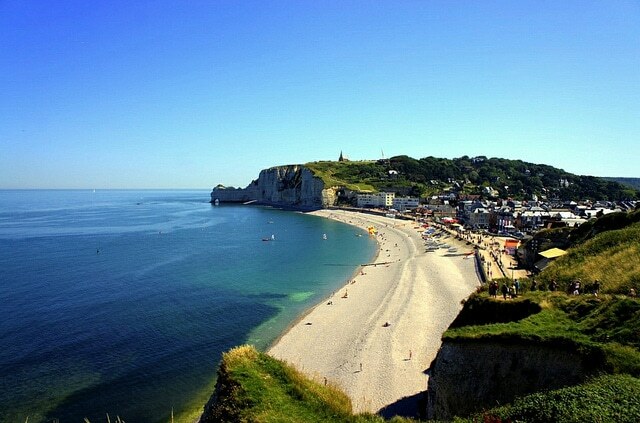 Etretat is a small fishing town overlooking a beach of smooth pebbles and dominated by towering white cliffs and crags calls. 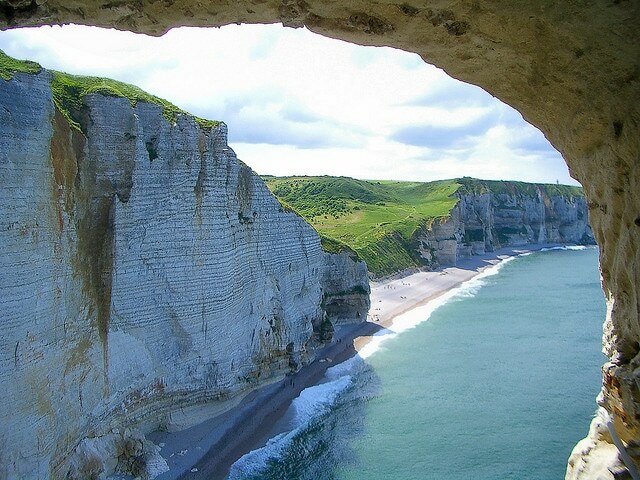 Two in particular, the Falaise d’Amont and the Falaise d’Avel. 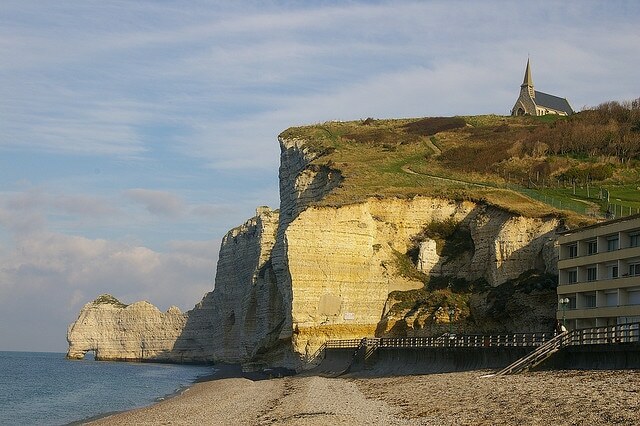 It really worths a trip to this part of Normandy. On top of the first, which is reached by climbing a steep path, is the Chapel of Notre Dame de la Garde. A monument and a museum dedicated to Nungesser and Coli, the first aviators that on 8 May 1927 attempted to cross the north Atlantic Ocean aboard the White bird. The latter is reached by a staircase that leads to a beautiful lookout point from where you can admire also a golf course, so beautiful and magnificent circuit that looks at the cliffs and the ocean. 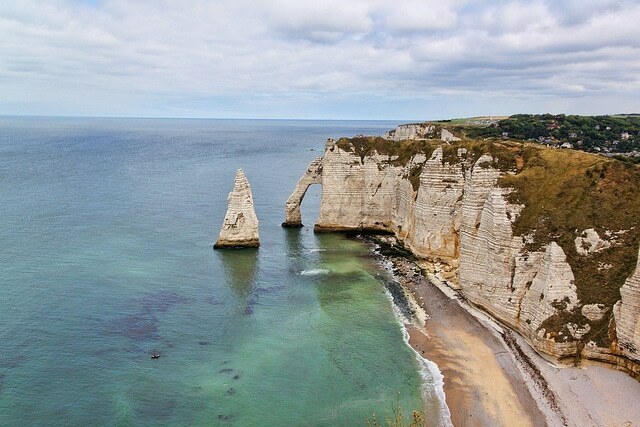 On the Falaise d’Avel leans there is the extraordinary rock arch of Manneporte, behind which stands the Aiguille, a rock in the shape of an obelisk 70 meters high. Strolling at the foot of the cliff, maybe on the beach to enjoy the sound of the ocean waves and to appreciate its colors and smells of the coast and the algae, you will often see signs that warn of the danger of collapse and rockfall. But what happened days ago not far from here, in Saint Jouin Bruneval, advises us to be careful and to take seriously the warnings: a block of rock estimated at 30 thousand tons crashed to the ground, fortunately without burying anyone. Where To Go For The World’s Best Family Sailing Holidays?